While the other Grisha-verse books are distinctly YA this is probably not, a lot grimmer and grittier, but still good fun HEAPS of banter -(which was something I loved about the other books too). I did notice the characters are given very young, rather YA-appropriate ages, but many of them just don't feel or act like they're that young, all of them read at least five years older than the ages they were given - this could be because of their being thrown in the deep (and dark) end of life very early, but I just couldn't quite buy some of their stated ages. For what is essentially a heist novel pretty much everyone is paired up ;p I'm not sure if I'm imagining Wylan and Jesper (I am a shipper of almost any coupling, so have been known to make pairings up in my head ;p ) but if not intended then there were some very cleverly placed mis-leads. I did like this though, because the relationships were nowhere near straight forward, all complicated little labyrinths which are so fun to read (but not fun to live, trust me). The characters were all wonderful and deep, rich backstories and believable motivations, and it's wonderful to see the world of the Grisha-verse but be in a different country than Ravka. And that end y'all! I mean obviously there was going to be a double cross -- if there hadn't what kind of heist novel would this have been -- but damn son! I had soooooo many people recommend this book to me and i just wish I'd gotten around to it sooner. 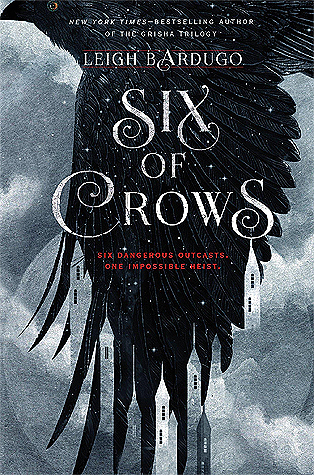 Sign into Goodreads to see if any of your friends have read Six of Crows.